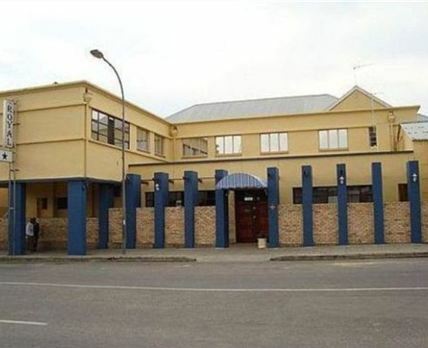 Royal Hotel offers comfortable rooms and is situated in the beautiful area of Somerset East. Guests are invited to come and enjoy the friendly and attentive hospitality on offer. The hotel has a wide range of rooms to suit the family, budget traveller and business travellers to the area. The rooms are clean and comfortably furnished with all bedding provided. The hotel also has a fully licenced bar, a conference facility and a large function hall. Guests can enjoy meals from the a la carte menu with full room service. Breakfast is available at an additional fee. Guests can make use of the outdoor braai facility with a braai and seating. The indoor communal lounge area offers a comfortable gathering space and has a warm fireplace. There is also ample secure parking for guest vehicles. Somerset East is a beautiful town on the Blue Crane Route in the Eastern Cape. This quaint and serene little town is famous for its natural beauty, as well as for its many beautiful National Monument Buildings. Click here to enquire at Royal Hotel.